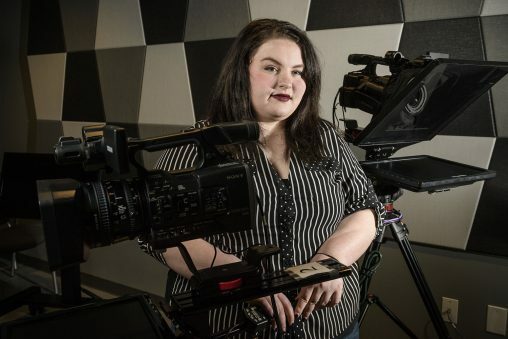 It turns out that putting students in Wright State University’s New Media Incubator and turning them loose in a studio and control room with video cameras and other state-of-the-art equipment can help them learn French. It was a research project conceived by communication studies major Amanda Harris, who works as an intern in the incubator. She had the beginning French students work on their French by producing storytelling videos that became their final presentations in French class. “One group in particular was hugely engaged and all ended up with A’s at the end of the semester,” said Harris. Harris’ research caught the attention of organizers of the Computers and Writing Conference at George Mason University in Fairfax, Virginia. She was invited to present her findings at the event, which was held from May 24 to 27. The theme of the conference was “Digital Phronesis: Culture/Code/Play,” with submissions focusing on the intersections of formal learning and embodied experience. Harris’ presentation involved how to use digital media to support interdisciplinary collaborations through active-learning strategies. The French students were those of Jean-Michel Lamoine, the project’s initiating instructor. Harris was mentored by Ashley Hall, assistant professor of English language and literatures, and Jen Ware, assistant professor of multimedia. In the project, the French students not only learned and practiced French, but they did it while learning how to produce videos — from writing the scripts, identifying props and editing the videos. One student group did a French version of the television show “Family Feud.” Others did a news broadcast and biographies. “One video got shown in French class because it was just that good,” said Harris. More importantly, she said, the students were deeply engaged in the project and having fun as they learned French. Harris said the learning project can also be applied to other areas. In fact, a group of students recently used the incubator to learn organic chemistry, producing a “Jeopardy” television episode based on chemistry questions and answers. Harris, 26, is a first-generation college student. Her father owns a heating and air conditioning business, and her mother owns a landscape design company. Her family moved from Hamilton to Lebanon, Ohio, when Harris was 13. Before graduating from Lebanon High School in 2010, Harris enrolled at Sinclair College to study art history. She graduated with an associate degree in fine art in 2012. After taking a few years off school to recharge her batteries, Harris enrolled at Wright State in 2016. She is majoring in communication studies with a minor in French. Harris is studying digital media, which includes text, photos, audio, video and other content from television, newspapers and magazines that can be transmitted over the internet or computer networks. Harris would like to go on to graduate school and study English or the humanities. She ultimately wants to teach at the college level and write research papers. “I love doing research. I love figuring things out,” she said. “And I really like observing people.